MODERATOR: So [Senior State Department Official] is just going to talk on background as a State Department official a little bit about the Secretary’s meetings today and some of what [State Department Official] has been doing on Iran and engaging our partners and allies. So we’ve just got 10 minutes, so [Senior State Department Official], you good? SENIOR STATE DEPARTMENT OFFICIAL: Okay. QUESTION: We can’t hear anything. SENIOR STATE DEPARTMENT OFFICIAL: I’ll speak loudly. There was a delegation of senior State Department officials from various bureaus who spent three days in Saudi Arabia for consultations with the minister of foreign affairs, minister of state, the defense minister, the energy minister, and the chiefs of state security, and the chief of intelligence. And we went to Saudi Arabia to coordinate stronger pressure on Iran. We discussed new ways to deprive the regime of revenues to terrorize people and to terrorize other nations. We discussed how Iran uses embassies as cover to plot terrorist attacks. The most recent example is the plot that the Belgians foiled, and we had an Iranian diplomat out of the Austrian embassy as part of the plot to bomb a meeting of Iranian OPPOSITION leaders in Paris. And the United States is urging all nations to carefully examine diplomats in Iranian embassies to ensure their countries’ own security. If Iran can plot bomb attacks in Paris, they can plot attacks anywhere in the world, and we urge all nations to be vigilant about Iran using embassies as diplomatic cover to plot terrorist attacks. In our meeting with the Saudi energy minister, we discussed maintaining a well-supplied oil market to guard against volatility. We coordinated – we discussed U.S. oil sanctions to deny Iran revenue to finance terrorism. We talked about minimizing market disruptions and helping partners find alternatives to Iranian supply of oil. Very broadly, Saudi Arabia is a key partner in our effort to isolate and pressure Iran. And as I said, we had a number of bureaus from the State Department to discuss energy, diplomacy, security, and economic pressure. We were also joined by Treasury Under Secretary Sigal Mandelker for some of these meetings so that they can hear from Treasury officials and coordinate our efforts on applying maximum economic pressure on Iran. We also have State Department officials visiting – they have visited Bahrain today. We have the Secretary, who has concluded his visit to Abu Dhabi. And these visits from the Secretary and senior State Department officials in the Gulf, spending a number of days with UAE, Saudi, and Bahrain, shows that the United States and its Gulf partners are working very well together to push back on Iran until it starts behaving like a normal country. The combined efforts of the United States and Gulf states are a powerful deterrent, and we will continue to explore ideas and initiatives to raise the costs on Iran for its malign behavior. We will be in Brussels for the next couple of days for the NATO summit, and the Secretary will use various opportunities to consult with E3 ministers informally on the way forward on Iran. But he will also be conducting other bilats, and Iran will be on that agenda. QUESTION: [Senior State Department Official], you were obviously in Vienna. You saw some of your counterparts there. Was the meeting of the JCPOA the first since the United States dropped out of the deal? What happened there? I mean, you’ve been talking about basically preaching to the choir with your friends in the Middle East, and Europe isn’t quite the choir anymore for you guys. How did those meetings go? Are you going to be able to get back on track with Europe post breakup? They have sounded far more skeptical of doing the kinds of things you had sort of gotten them to agree to if you had stayed in the deal (inaudible). SENIOR STATE DEPARTMENT OFFICIAL: There was a scheduled meeting of political directors in Vienna on the margins of the Joint Commission ministerial. Logistically, we ended up having some scheduling issues, so we will be meeting with the political directors in Brussels. We had to postpone the meeting by a couple of days to accommodate some – since you had all the ministers in Vienna and there was only a short window to pull the meeting off, so we’re going to be doing it in Brussels tomorrow or Thursday. QUESTION: Which political directors will be in that meeting? SENIOR STATE DEPARTMENT OFFICIAL: The UK, France, and Germany. SENIOR STATE DEPARTMENT OFFICIAL: Yes. There is still – no matter how much people write about the transatlantic rifts, in the case of Iran, we agree on much more than we disagree. The European nations are as frustrated as we are with Iran’s missile program, missile attacks, which they are facilitating with the Houthis. We’re seeing press reports just now about the Saudis intercepting another Houthi missile, which I think we can presume was supplied by the Iranians. So we will continue to work with the – our European allies on – to address the entire range of Iran’s malign threats. And there’s no shortage of work to be done, and we’re working well together on those threats. QUESTION: Well, (inaudible) in terms of the embassies (inaudible). So I know there’s been a lot of talk aimed at this arrest of the Iranian diplomat (inaudible) maybe not a false flag, but some kind of a – you think it’s legit, number one? And then two, are you going beyond this urgent call to look at diplomats, to say that they should be expelled, that they should be closing Iranian embassies? SENIOR STATE DEPARTMENT OFFICIAL: The most recent plot in Europe by Iranians is another chapter in a long history that dates back to 1984, when Iran was starting these hijackings on commercial airliners, bombings, assassinations. So when you look at what Iran has done just in Europe since 1984 and continuing up to the present, all nations need to exercise vigilance to protect themselves against the Iranian threat. And this is only the most recent example of Iran using diplomatic cover to plot terrorism. And we certainly want all countries to make good decisions about their own security, and we think Iran presents an enduring threat to nations, and they need to be vigilant. QUESTION: And so you take this arrest and then this (inaudible) seriously? SENIOR STATE DEPARTMENT OFFICIAL: Very seriously. We are working very closely with the Belgians and the Austrians and the Germans to get to the bottom of this plot to conduct a bomb attack in Paris that had two Americans speaking, attending. QUESTION: And you believe Iran is responsible? SENIOR STATE DEPARTMENT OFFICIAL: Yes, we do. QUESTION: Do you know whether the target was the MEK or the Americans visiting (inaudible)? SENIOR STATE DEPARTMENT OFFICIAL: I can’t speculate on that. MODERATOR: Just a couple more questions. SENIOR STATE DEPARTMENT OFFICIAL: We do not believe Iran’s ludicrous claim that this is a false flag. QUESTION: What about – the fight obviously against Iran has led to a disastrous situation in Yemen. The Secretary had conversations with (inaudible). How – what is the United States looking for in terms of UAE’s attacks in Yemen and the situation improving in Yemen? It keeps getting worse. SENIOR STATE DEPARTMENT OFFICIAL: I think some of this is covered in the readout. Do you have the readout yet of the meeting? Was that supplied? QUESTION: Yeah, we do. We got the (inaudible). SENIOR STATE DEPARTMENT OFFICIAL: Well, the Secretary has talked of the role that Iran has played to really worsen and deepen the humanitarian situation in Yemen. When Iran supplies missiles that are fired into a commercial airport, it threatens people from every nation who are flying into another country’s airport. So we talked about how to better deter Iran, how to cut off their supply lines so that they’re not able to supply the Houthis with material to conduct bomb attacks inside Saudi Arabia. We think a role – that Iran has played a very large role in contributing to the humanitarian catastrophe in Yemen. QUESTION: What about Saudi or Yemenis’ responsibility in Yemen, Saudi or the UAE? MODERATOR: Guys, we – we got to – we got to go, but I can – I can – I think I can probably connect you with David Satterfield, who’s been involved in the – he’s our Yemen guy. SENIOR STATE DEPARTMENT OFFICIAL: On the political track, yes. MODERATOR: On the – yeah (inaudible). 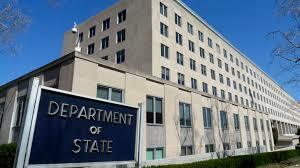 SENIOR STATE DEPARTMENT OFFICIAL: Well, we very strongly support the work of Martin Griffiths and we know that there’s been a lot of – Martin has been working very hard on this and so we strongly support those efforts that are led by Martin Griffiths. QUESTION: -- the November deadline? SENIOR STATE DEPARTMENT OFFICIAL: Yeah, November 4th. Well, the – we are – we know that most of Iran’s hard currency is derived from its exports of oil, and Iran uses its oil revenues to finance foreign wars and stoke violence throughout the Middle East. I mean, we are very serious and determined about re-imposing our sanctions that were lifted under the Iran nuclear deal, and we are working very closely with nations to provide alternatives to the Iranian supply of oil. We’re very confident that we’ll be able to do that without minimizing – without – and we’ll be able to do that without market disruptions and working closely with the Saudis and other oil producing nations to make sure that we have a well-supplied oil market. SENIOR STATE DEPARTMENT OFFICIAL: Our road show teams have been in Japan and Korea and have had very good consultations with them on the snapback of our oil sanctions. MODERATOR: [Senior State Department Official] has got to get back to work. Thanks, guys. SENIOR STATE DEPARTMENT OFFICIAL: Thank you.